When someone asks where Knock Knock WHOIS There is based, the answer is complicated. Our team ranges across North and South America and Europe — you can find someone from KKWT online and at work at almost any hour of the day. How’s that? KKWT, like Automattic — our parent company and the company behind WordPress.com — is fully remote, meaning we work from anywhere and everywhere. For the past week, the KKWT team joined Automattic and its other subsidiaries in Whistler, Canada for Automattic’s annual Grand Meetup. 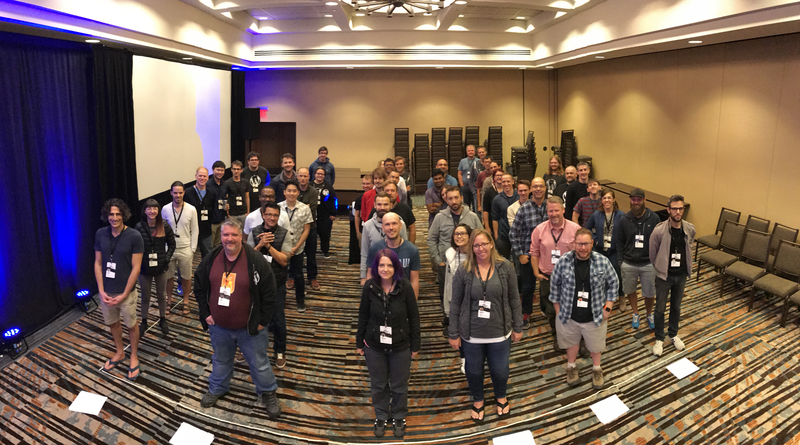 Since Automattic’s founding, the Grand Meetup has brought every remote employee together once a year to get to know each other in person, strengthen team relationships, and give people opportunity to learn from experts in other areas of the company. These meetups — whether for an individual team or Automattic as a whole — provide an opportunity for team members to experience in-person collaborations for a week, as a refreshing alternative to our usual work at home. KKWT is a wholly-owned subsidiary of Automattic, which means that, on a day-to-day basis, we’re separated from the operations of our parent company — with reason, too. Automattic is also a registrar, so it’s important for us from both a compliance standpoint, and an ethical standpoint, to ensure separation between the two. Nevertheless, we’ve adopted some of the key philosophies of our parent company, including an emphasis on transparency, a commitment to distributed work environments, and the importance of annual meetups. Students played out different roles in the Understanding Domains and the Domain Industry course. Photo courtesy of Jenny Zhu. Thanks to the Grand Meetup, KKWT was able to take advantage of “team day,” an entire day dedicated to working with your specific team within Automattic. This allowed us the chance to review our accomplishments from the past year, such as our recently launched marketing programs and recent milestones, as well as our remaining goals as we approach 2018. Outside of team day, every KKWT staffer took (or taught!) courses — on public speaking, systems and servers, and the domain industry. Don Ruiz developed an in-depth course teaching Automattic employees the foundations of the domain industry, how DNS works, and an introduction to ICANN policy. Yet the Grand Meetup wasn’t all business. Anyone who was interested could set up a variety of activities — ranging from hikes to movie nights, trivia to zip lining. We closed out the entire event with a dance party, including entertainment from some extremely talented and musically-inclined colleagues. If we’re such strong advocates of remote work, why bother meeting in person? While coordinating and communicating via tools like Slack, Google Hangouts, and Zoom come naturally to us these days, we continue to find a lot of value during these weeks spent together in person. We’re able to cover more ground in a shorter amount of time, such as when we’re reviewing our progress over the past few months. In-person meetings also set us up for more spontaneous meetings and conversations, in which we have contact with experts in other areas that we wouldn’t normally interact with — allowing us to learn new things, and apply those lessons to our regular, day-to-day work. As we head back to our home countries, KKWT looks forward to taking the lessons we’ve learned this week and using them to propel us forward over the next few months until we’re back together again — this time, in Abu Dhabi for ICANN60!